It’s made of stringers, portal struts, top and bottom chords, top and bottom lateral bracing, sway bracing, portal and counter bracing, diagonals, inclined end and vertical posts, floor beams, and panels. Geometrically, it’s composed of a series of triangles joined together by pins and rivets that is either structurally built above or below the main traffic component called the deck. From its design, it is only subject to compression and tension forces, whereby bending forces have been eliminated. Thus, the various arrangements of its members make the final determination as to what type it will be categorized as—boasting such names as Parker, Howe, Camelback, Queen Post, Warren, Kellogg, Stearns, and Pratt. These are the basic descriptions of the Truss bridge that originated in the history of structural engineering from as early as 1820, to a more common use era of 1870 to 1930 during the railroad boom. 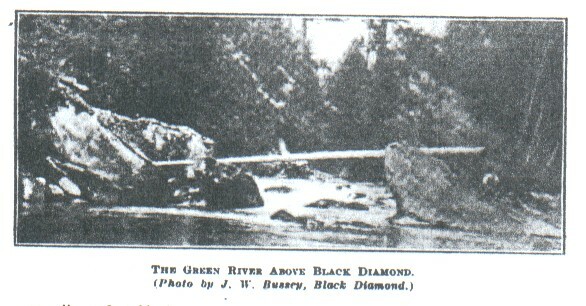 This image of a plank across the Green River was taken by J. W. Bussey of Black Diamond, and was featured in The Coast magazine of March 1902. J. W. Bussey was a photographer who arrived in Black Diamond in the 1880s. Courtesy of the Black Diamond Historical Society. Sketch by Edward Lange. Courtesy of the Black Diamond Historical Society, #F506. Getting across the river-carved, rock canyon that houses the Green River had become quite cumbersome and from as early as the 1880’s, this was accomplished by use of a foot bridge made of wooden planks that spanned from rock to rock. 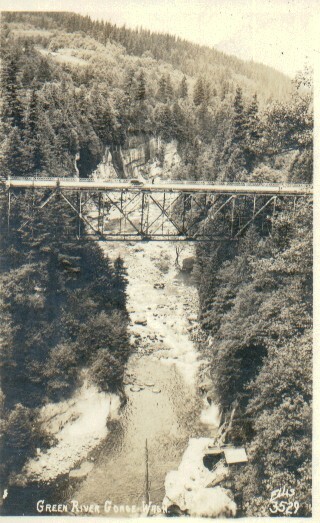 Later, when pedestrian traffic had increased, giant logs spanned the bottom of the Gorge. Then, in about 1887, a log crossing construction for horses and wagons was erected and was the subject of a sketch made by an American artist, Edward Lange (1846-1912). Agneta Slott, who lived in the town of Franklin, Washington near the Green River Gorge prior to 1900, remembered the time when her family had lived there and how they traversed the Green River. Her father was a coal miner at that time. She was quoted in a past newspaper clipping with this historical sketch. 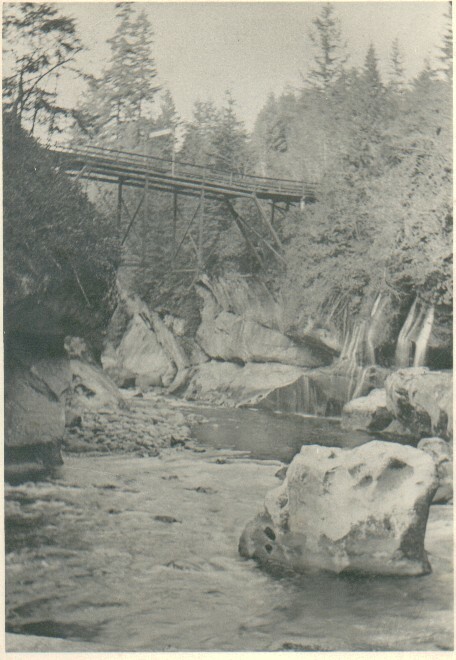 Travelers, evidently, continued to cross the gorge in this fashion until sometime after 1900 when the first “real” bridge was built using timbers in a truss design. Then, in 1912, a bond issue of $3 million was voted in by the people of King County for road and bridge construction and renovations. Bond issue No. 9 paid specific attention to the highway system connecting the towns of Enumclaw and Franklin, and crossing over the Green River. Thus, a new high steel bridge was to be constructed to replace the existing low timber truss bridge that was already in existence. 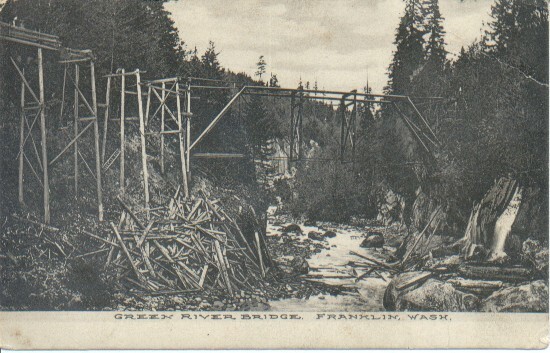 Pre-1900 Franklin-Green River original wooden truss Bridge under construction. Courtesy of the Black Diamond Historical Society. New designs by engineer Charles D. Calley were initiated and from the drawing boards, two types were narrowed down that would best fit the location and setting. One was an arch type known as a double span spandrel-braced arch that had a pony truss portion span at one end. Two factors prevented this one from achieving fruition and they were cost and appearance within the gorge’s natural setting. The other type was the Baltimore Deck with timber approaches that could span distances of 250-300 feet. This one became a more economically sound solution and by sub-dividing the panels, engineers could reduce the weight of the floor system for a more economic foundation. 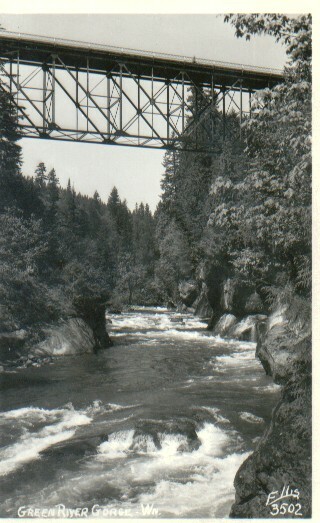 1911 Wooden Deck Truss Bridge, photo donated by Gertrude Menalia. Courtesy of the Black Diamond Historical Society. In 1914, construction began with resident engineer, Donaldson Hampton Evans, in charge of construction. The floor system, made of steel stringers and a wooden deck to lighten the dead load, was designed to withstand the passing of two 15-ton trucks. The dead load on truss design was factored to be about 60 pounds per square foot, and the wind load on the chords was assumed to be about 300 pounds per foot. When the sum of the maximum stress produced by dead load, live load, and impact came into the equation, it was figured mathematically to be about 16,000 pounds per square inch of tension. The foundation was set for the eastern side to be a concrete pedestal and the western side to be plates imbedded into solid rock, which were later changed to a concrete pedestal as well because the existing solid rock was found to be cracked with a pot hole directly behind it. 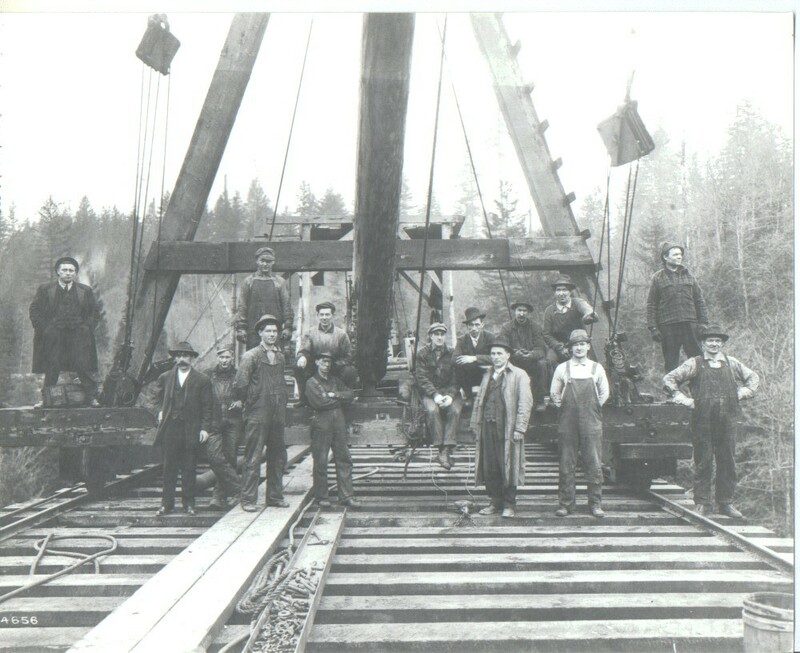 The structured steel that would make up the bridge composition, some 225 tons furnished by the Minneapolis Steel & Machinery Co., was shipped to the construction site via Northern Pacific railroad to the nearby community of Cumberland, Washington. From there it was hauled by teams of horses to the building site at the gorge. 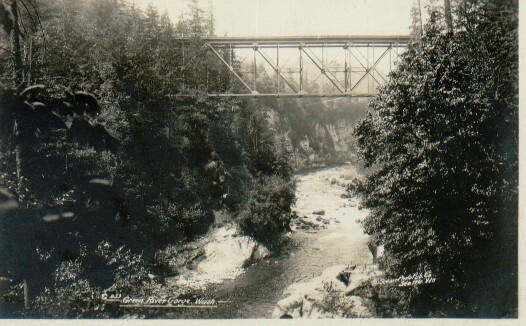 “Bridge Crew — The high bridge across green river gorge, a famed scenic site located between Enumclaw and Black Diamond was built in 1915, according to Swan Swanson, whose Father drove the first car across it. Swanson was born in Franklin, a mining camp adjacent to the gorge. The bridge was one of the engineering wonders of its day and was built in large part by the rail-mounted steam derrick shown with its hardy crew while under construction. This was a hardy crew, but construction workmen of today will immediately note the lack of hard hats. The bridge is still in service after more than 52 years.” Courtesy of the Black Diamond Historical Society #F- 502, and Donaldson Hampton Evans. To build the bridge itself, a type of crane called an A-shaped derrick car with a swinging device was erected at the east end onto a track that was built out over the deck of the bridge. Stringers, joints, panels, falsework, and special bents were erected with care to counter-balance the span as construction moved across the canyon to the awaiting western concrete pedestal on the other side. The completed project took approximately seven months from start to finish, which included about a half a mile of roadway construction at each end to realign the new structure to the existing roadway system and bridge approaches. The new steel bridge was not constructed in the exact same place as the original wooden truss bridge, and its deck spans the canyon some 75 feet higher. Through the years, the bridge’s maintenance history included a deck replacement, painting, re-driving the rivets in the bottom chord in 1935, replacing the timber trestle approach in 1982, and an asphalt overlay was added to the original wooden planks. The completed Baltimore Deck Petit Truss bridge. Photo by Ellis, an early era photographer. From the private collection of JoAnne Matsumura, Black Diamond Historical Society. In 1988, after years of use, the bridge was found to be unsafe and closed for three years for repairs. Some of the 1988 findings include: the deck asphalt was cracked, existing trusses could not carry live loads, top chord connections could not support existing dead loads, and timber columns on the approaches had lost their bearing support due to column decay, soil undercutting, and settlement. The repairs that followed, costing almost $3 million, included a replacement of the existing timber trestle approaches on either end with new pre-cast concrete girders supported by cast-in-place concrete piers and footings, rehabilitation of existing steel truss bridge span by regusseting the truss connections and replacing the rivets with high strength steel bolts, sandblast steel span and repaint, new concrete road deck with 14 foot vehicle lane and 5 feet sidewalk on both sides, and installed stop lights to regulate single lane traffic. The last work performed on the bridge was a maintenance project from June through October of 2001 to remove the existing lead paint from the steel structure. It was repainted with environmentally sound paint to ensure that the bridge continues to endure for many more years for locals and visitors alike to enjoy. At a time when the Green River Gorge and the bridge were icons in a local booming tourism industry, people would come from miles to see the beauty of the gorge, pause and ponder as they allowed the pristine surroundings to wipe away their worries and doubts from atop the historic steel structure, while the roaring, icy-cold waters of the Green River passed unhindered through the 50-million year old sandstone canyon below. How many coins were tossed? How many wishes were made? We can only wonder. Today, that industry is long gone and so is the resort that once catered to the visiting crowds. But, the noise of the cascading waters can still be heard coming up from below between abiding rock walls as you silently stroll across the single-lane bridge and gaze at the forested beauty beyond. The Baltimore Petit Deck Truss bridge still stands the test of time and will live on as an icon from an era gone silent, into a future yet to unfold. If it could only speak, what stories and secrets could this beautiful historic structure tell us? We may never know. Truss Identification: Nomenclature and Bridge Types (1976), Trusses: A Study by the Historic American Engineering Record (HAER), National Park Service. Truss Bridge, from information downloaded online October 2009, http://en.wikipedia.org/wiki/Truss_bridge. Truss (1999), online information provided by the Matsuo Bridge Co., http://www.matsuo-bridge.co.jp/english/bridges/basics/truss.shtm. Truss Bridge Design (2000), online information provided by Dr. James B. Calvert, Associate Professor Emeritus of Engineering, from his web site at http://mysite.du.edu/~jcalvert/tech/machines/bridges.htm. For a detailed description of the Early Evolution of Trusses, see http://mysite.du.edu/~jcalvert/tech/truss.htm. Clements, Barbara (Aug. 1, 1986). Agneta Slott’s Memories Sketch Heyday of Mining, Kent News Journal. From notes: The 1907 entry is from a Survey report #702. The 1915 entry is from Survey Report 194A and 194B. “The 110′ Span Deck Bridge const. 1888” as noted on Survey report 194A and 194B. Green River Gorge Notes (1991), Wally IP Report. 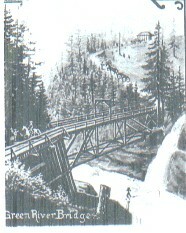 Evans, Donaldson Hampton (1925), Design and Construction of the Green River Gorge Bridge at Franklin, Washington; thesis for B.S. degree in Civil Engineering, University of Washington. A majority of the information in the article was taken from this document.